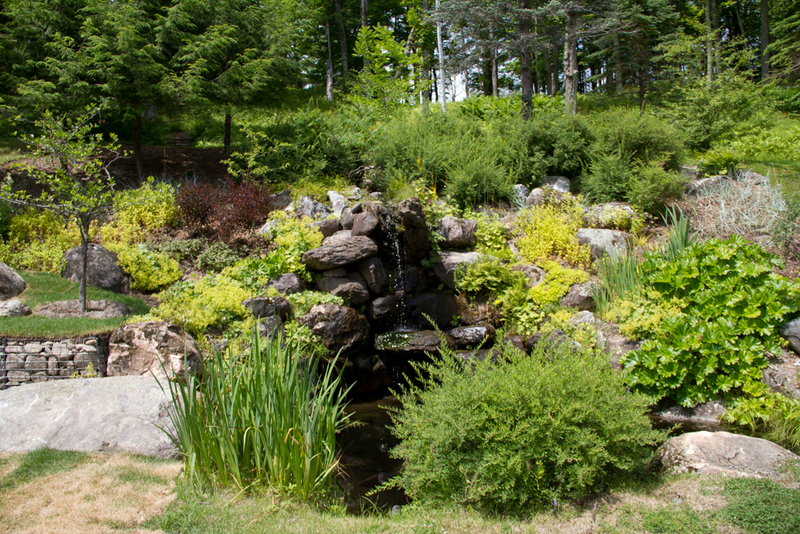 One of the first areas we added to the garden at Glen Villa was the Cascade. It came about almost by accident, as we were modifying the entry to the house. Doing this meant lowering the driveway by eight feet; as we did, we uncovered a stream hidden underground. And so the Cascade was born. Unfortunately I have no photos of the original plantings. 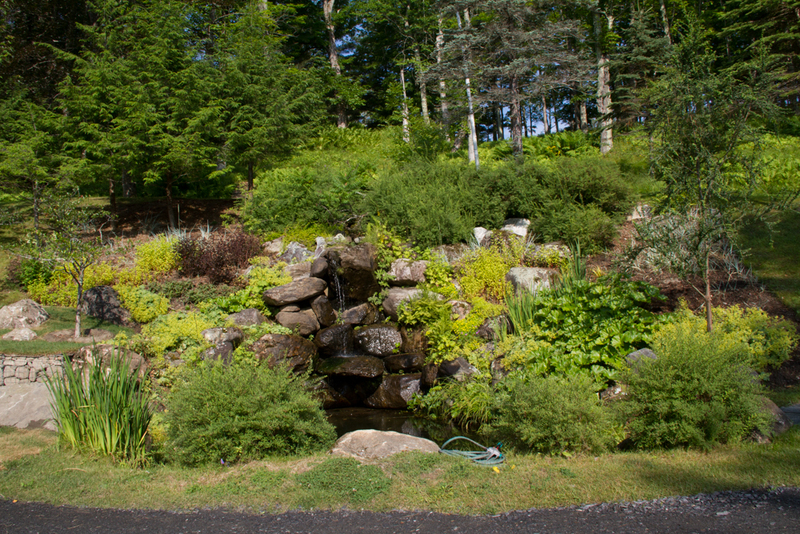 Only a few of them remain, one or two hawthorn trees, the spruce that were tiny when planted about 15 years ago, the bridalwreath spirea that drips with blossoms every spring and the staghorn sumac that initially provided wonderful autumn colouring. 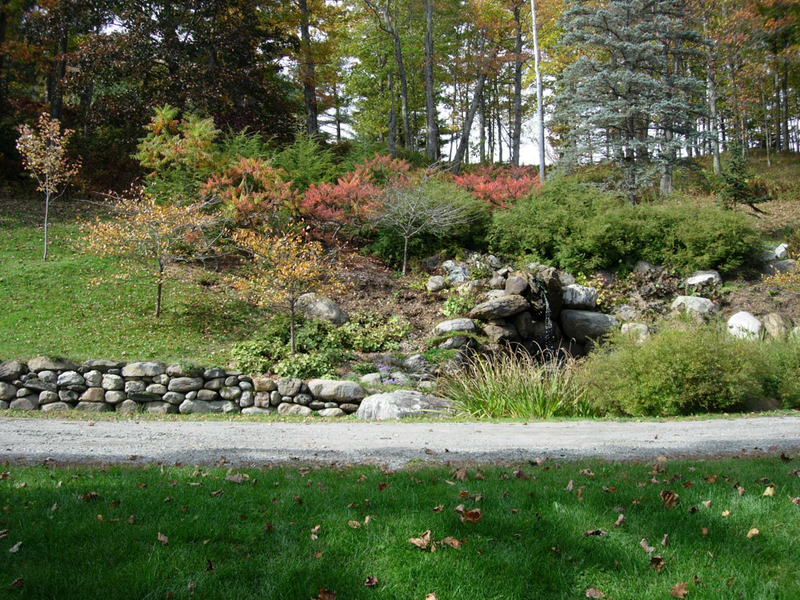 This view from October 2005 shows colourful sumac and a very informal stone wall that was replaced last year by a gabion wall. 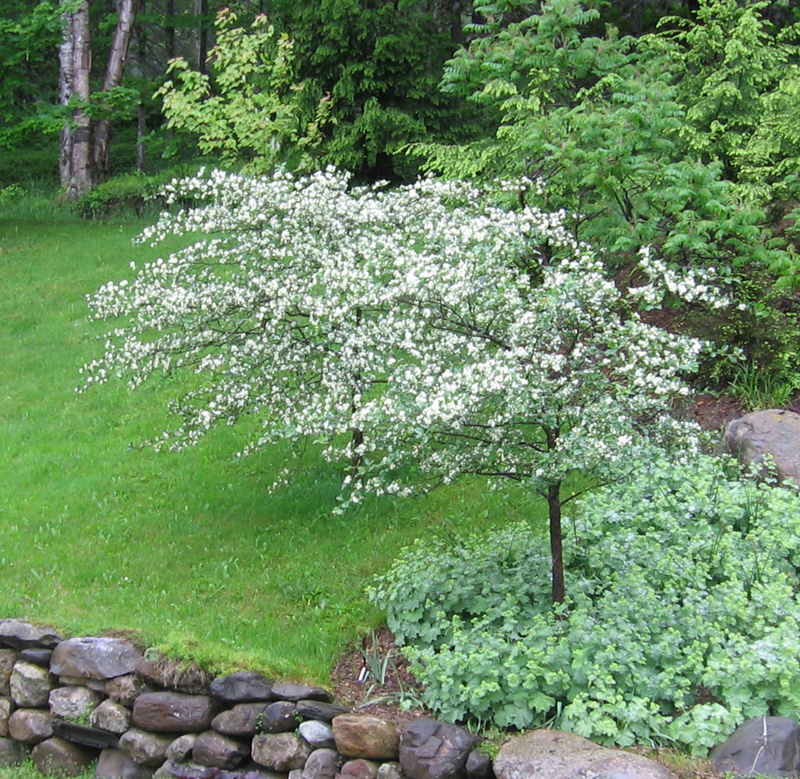 This photo from June, 2006 shows a lop-sided hawthorn tree, but one with lots of branches, all in full bloom. 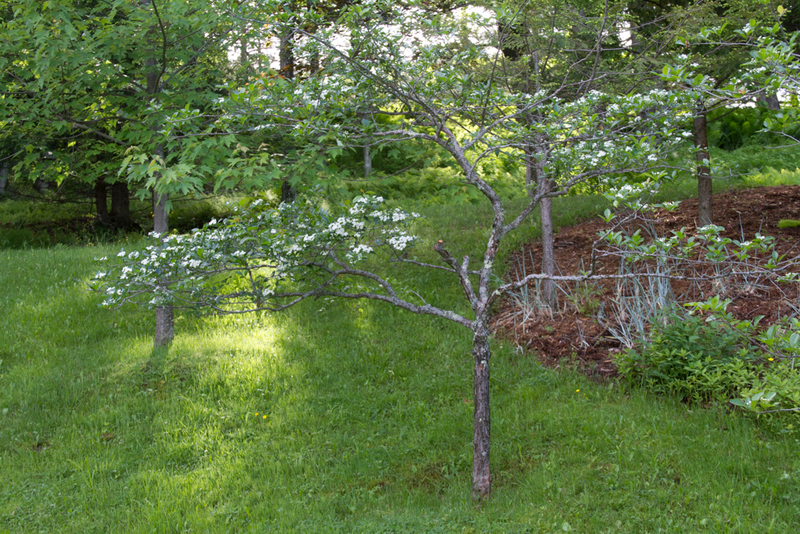 Three years later the hawthorn had fewer branches and very few blooms. This photo is from 2014. Moving the tree during work on the gabion wall that replaced the previous uneven wall didn’t help. 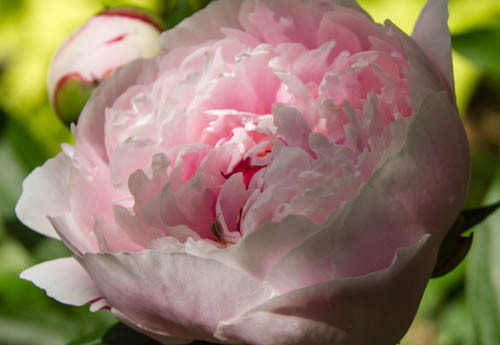 Other plants performed in a similar fashion, starting off well and declining from one year to the next. We enriched the soil, we added drainage, we closed our eyes and held our breath. Despite this, plants refused to thrive. A dogwood (Cornus stolonifera ‘Kelsey’s dwarf’) succumbed to the cold; a ninebark (Physocarpus oplifolia ‘Summer Wine’) fell victim to the deer. The dwarf highbush cranberry (Viburnum opulus ‘Compactum’) became bug infested and had to be removed. The Ligularia dentata ‘Britt Marie Crawford simply stopped trying. The viburnum are the small shrubs with posts behind them. We staked the shrubs so they would grow upright rather than fall forward on the slope. 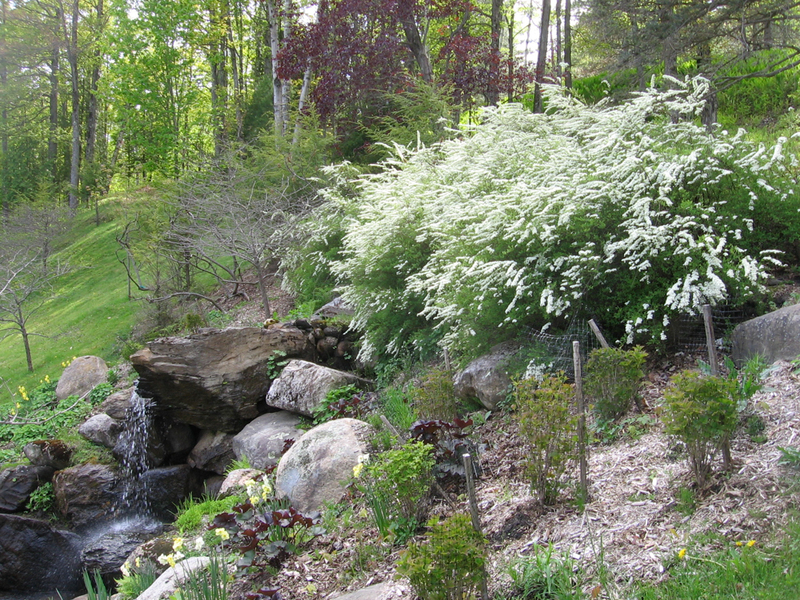 The cascading bridalwreath spirea continues to be a joy every spring. 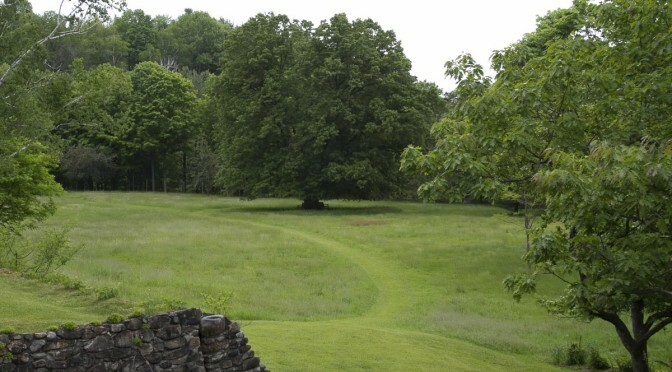 In desperation I chose plants that were said to be invasive, like blue lyme grass (Leymus arenarius.) I read the warnings and rejoiced — a bit of unruly invasiveness would be just fine. 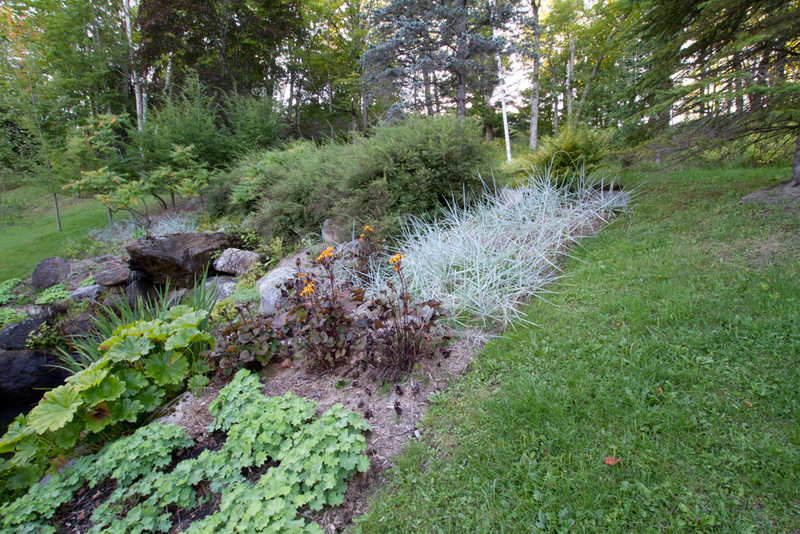 I planted the lyme grass in 2008 and at first it looked wonderful, blue-toned spikes providing a contrast to the fine leaves of spirea and the broad leaves of Ligularia dentata ‘Britt-Marie Crawford.’ When the lady’s mantle bloomed, it was even better. 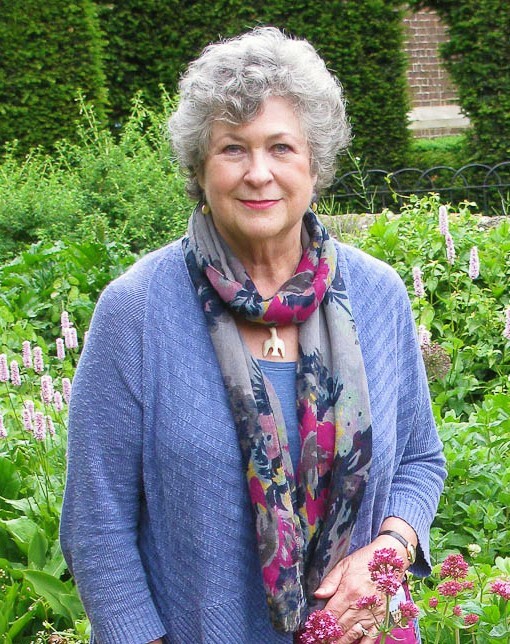 I wanted bands of plants to run horizontally across the central cascade. This combination of plants continued on the other side of the water. But gradually, instead of invading, the lyme grass became sparser. Not so with the lady’s mantle (Alchemilla mollis) and another invasive plant I decided to try, gooseneck loosestrife (Lysimachia clethroides). They grew and grew, determined to overwhelm the space, if not the world. Gooseneck loosestrife is nice when it blooms but I don’t like the yellowish shade of the foliage, particularly when combined with other yellow toned leaves. Last summer the plants were full but, to my eye, the area looked messy and lacked structure. Too much yellow, too little variety. 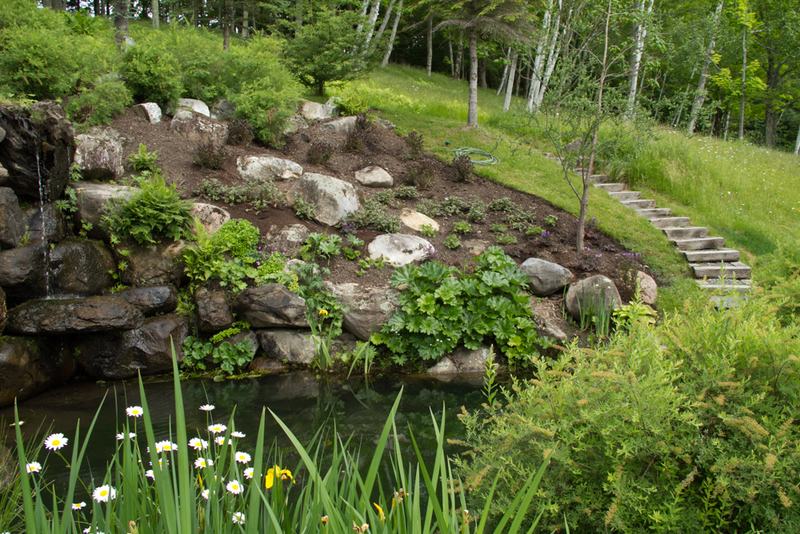 I like the spirea and the spiky iris in the foreground but the plantings felt out of keeping with the clean architectural lines of the new gabion wall, barely visible on the left. 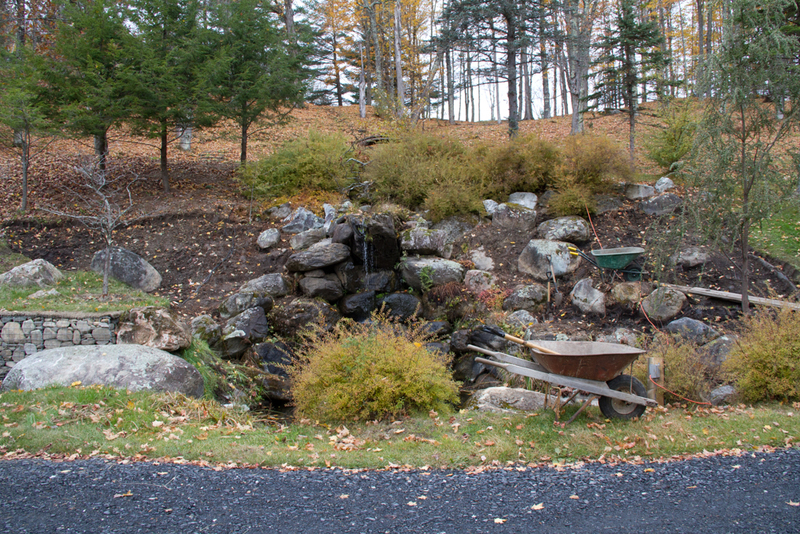 So last fall, we pulled out everything except the spirea, the sumac and the spruce trees. We improved the drainage — again — and added new topsoil and rich compost. A clean slate… My fingers are firmly crossed in hopes that the plants I’ve chosen this time will thrive. And finally, last week I began to replant. Yet again I’ve chosen plants that should do well. 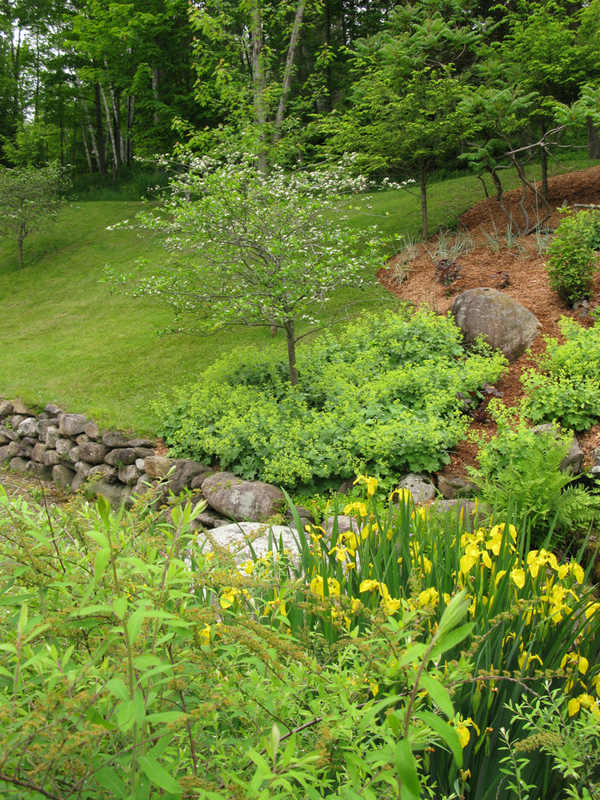 I’ve planted in bands that stretch across the central cascade, drawing the eye along the hillside and echoing the long line of the gabion wall that went in last summer. I chose Weigela ‘Wine and Roses,’ a shrub that has done well elsewhere in the garden, and one that the deer leave alone. I’ve added more of a plant I tried last summer, a small, spreading fleeceflower (Persicaria microcephala ‘Purple Fantasy’) whose leaves are marked with a shade of purple that repeats the colour of the Weigela leaves. I re-organized the darmera peltata whose large, clear green leaves add freshness and light, divided the yellow flag iris into several large clumps. A wayward patch of daisies is blooming among the yellow flag iris, a plant that survived the 2016 makeover. No photo taken when the plants are small can show what an area will look like after a year or two. For that, you need to use your imagination. Will this selection of plants thrive? Who knows. I’ve set up the right conditions, but I’ve done that before. So just to be sure, I added one final plant, a perennial geranium called ‘Hocus Pocus.’ If planning doesn’t work, maybe magic will. 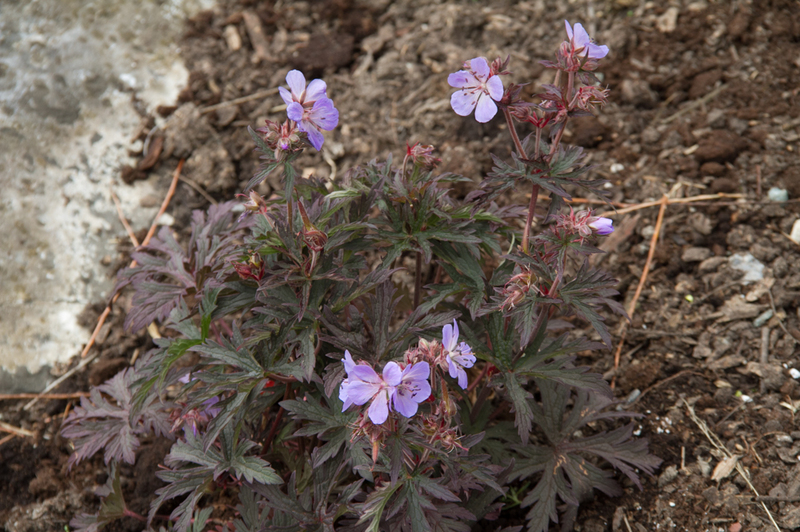 Geranium pratense ‘Hocus Pocus’ is a new cultivar that is much more attractive than it looks here. I hope it will cast its magic over the Cascade. 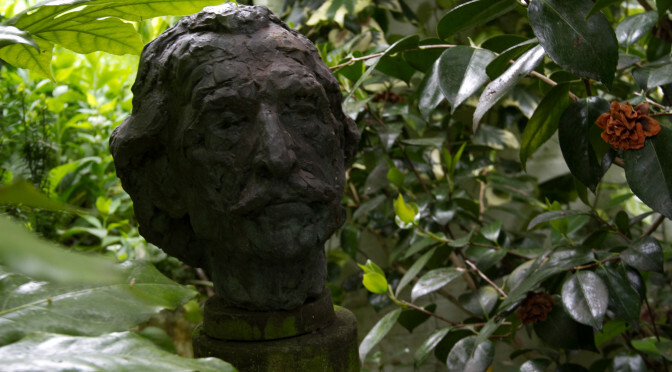 Are there area in your garden that continue to cause problems? What have you done to correct them? And is it working?